I finally have my own Magic: The Gathering deck! I’ve been trying to write a blog everyday, but, as is patently obvious, that hasn’t happened. My aunt is in town right now and she is staying with us and just making the whole house more distracting then ever. But I am glad she is here. I hadn’t seen her in forever and now I’ve been able to spend a few days with her. We (Britt, Mom, Jaime (the aunt), Maxwell, Zara and I) went to Target on Friday after Brittan and I got of off work. I got an awesome leather jacket that was on sale; a super cute sundress; three, dollar-section, fourth-of-July bowls; and the 2015 core Magic: The Gathering set. From that set and the 45 or so cards I already had, I’ve created four different decks which means all four kids can play Magic together. I made a deck that uses red and white mana with mostly flying creatures and like five or six different dragons. I also made a water and plains deck (blue and white) and a tri-color deck with black, red and blue mana. The tri-color deck is kind of a minotaur deck, but really I was just trying to eke another deck out of the cards I had, so that all four of us could play. The fourth deck was actually put together by Maxwell because he was the first kid I taught how to play (Brittan already knows how). He named his deck the Pirate Groots. It is a swamp and forest deck with an elemental in it whose art looks like Groot from Guardians of the Galaxy. He decided the swamp mana symbol looks like a pirate skull. Hence the name “Pirate Groot.” It’s a pretty good deck and he read and examined every card he put into his deck whereas I just grabbed cards that looked cool and shoved them together. In my defense, I have won every duel the two of us have played. Yesterday morning, before Brittan and I went to work, we had some extra time, so I taught Zara how to play and we tried to knock out a four-person game in under an hour. This did not happen at all. Every single one of us still had 15 or more health. It was a slow going game, but it was fun to play with all my siblings. 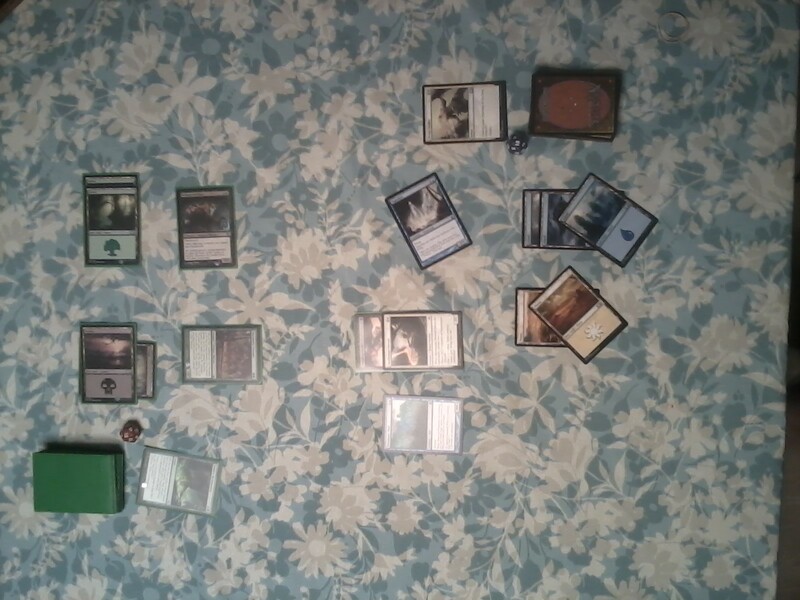 I learned how to play in 2013 and I won the 45 cards and 100 card sleeves that I started with in a Magic tournament that my gaming club on campus hosted. That’s also where I learned how to play. I joined the club, Gamers’ Guild, because I wanted to learn how to play Dungeons and Dragons. That was the first major role playing game I learned. I’ve since tried to convince my family to play, but it didn’t really stick. Unlike Dungeons and Dragons though, Magic: The Gathering is much simpler and Maxwell and Zara enjoy playing it much more. Also, since my freshman year of college I’ve convinced my family to buy new tabletop games and we play those a bunch too. We have Munchkin, Forbidden Island, Settlers of Catan and a bunch of others. Gamers’ Guild and the YouTube channel Geek and Sundry were the big influences that have made me a fully fledged tabletop gamer. I’m not much of a video game nerd, but I do play them sometimes. I’ve really grown into the nerd community, especially since my freshman year of college. That was three years ago and I have become one of the biggest nerds to ever nerd. It’s great. I really love the different online communities built around a love of a specific thing. I started this post just wanting to fill people in about my new Magic decks, but I’ve managed to wax poetic about my ascent into nerdom. Figures. Now, before I finish this post up I want to point out the widget on the right entitled “Currently…”. I created it to showcase the things I am currently doing. What I’m listening to, reading, writing, etc. If you have any ideas of what else to put in there let me know and I’ll add it. Right now the Currently Reading is a bit behind. I forgot to update the widget after I finished The Art of Asking by Amanda Palmer, and I want Seraphina by Rachel Hartman to receive as much screen time because it is an amazing book. That said, I finished it this morning and then went to Barnes and Noble to buy the sequel which I am excited to read after I finish All I Know Now by Carrie Fletcher. I bought it while I was in London this past May. It’s not actually out in the states yet, and I am looking forward to reading it. I’m waiting to start the sequel to Seraphina because I’ve decided to read a fiction book and then read a non-fiction book. I’ve picked up this pattern for my super summer of reading because I have a lot of non-fiction books that have been on my shelf for years and I just haven’t read them yet due to fiction books that I’ve perceived as more interesting. I’m hoping this pattern will get me through a lot of them this summer though. Expect a lot more book reviews. My review of Seraphina should be out later tonight or tomorrow. Until then, play more games. I’m excited to read your nonfiction reviews! The Art of Asking was non-fiction.